Teetering along a crumbling walkway over 100 metres high, a group of intrepid climbers carefully inch their way across what has been dubbed the most dangerous path in the world. And they're not alone. 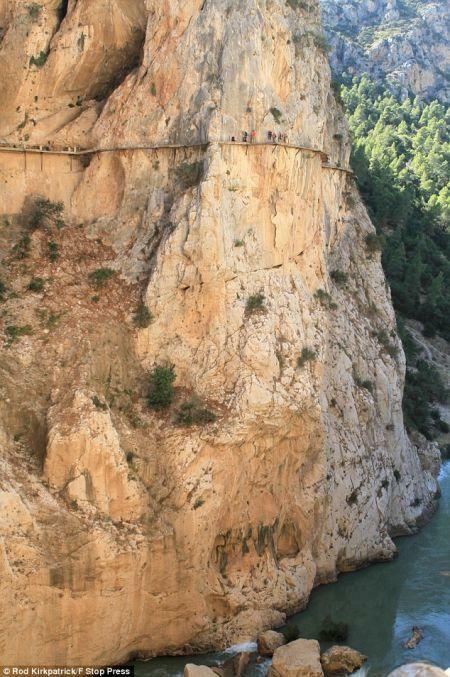 Adrenaline-junkies have been flocking to southern Spain to experience the 110-year-old El Caminito Del Rey before work begins to refurbish it next year. Companies have now begun offering unofficial tours after a video of a walker tackling the hair-raising trail went viral on YouTube. And you don't need to be an experienced climber either, the only requirements are that walkers should be at least twelve years old and have a good head for heights. The trail, also known as the King's Pathway, was originally built in 1905 for workers to travel between two hydroelectric power plants but was closed-off in 2000 after two walkers fell to their deaths. 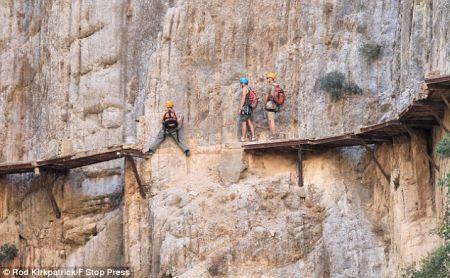 It snakes its way along cliff edges high up in El Chorro Gorge, thirty miles from Malaga. Much of the one-metre-wide walkway is crumbing away with rusting supports, gaping holes, no handrails and sections that have completely fallen down. A makeshift wire has now been attached to the rock face which walkers and climbers can clip themselves on to in order to have some degree of security - but many still prefer not to use any safety equipment at all. Work is now due to start on an 8.3 million project to make the pathway safe again and attract more tourists to the area. It will take three years to re-construct and will see the pathway completely rebuilt with handrails, protective barriers, lighting and a visitor’s centre. One climber on the route last week said: 'It's a shame they're going to fix the path. 'It will sanitise it too much and take the thrill out of it.